So, your honey asked you to be his wife. You (and your planners) have been working hard to plan your wedding but there is one part to the process that you are nervous to dive into - the wedding dress. It's hard enough going from shop to shop looking at dresses that eventually seems to blur together. You, however, have an added challenge. You are a plus size beauty and that seems to just add to the journey. You question could there possibly be a dress out there for you that will make you feel like the princess you always wanted to be, or a dress that will also show off those curves that you are oh so proud of. With the below 5 tips, you should be able to find that dress you envision yourself walking down the aisle in. This is key when shopping for clothes, so it is not different when shopping for your wedding gown. If you are a naturally top heavy woman, then a strapless dress may not be the best choice for you. If you want to draw a little attention to the area, then perhaps a sweetheart neckline might be the one. If you are voluptuous on the bottom half, a ballgown may not be the right fit. If you want to show off hips that may not be as defined as others, try a trumpet skirt and A-line gowns are flattering on just about any body type. Also, know how much sparkle you want. You want to stand out, but let's not go for disco ball. If sparkle is not your style and you want simplicity, find unique elements in a dress that suit you. It could be ruching around the waist or a scalloped hem. It all depends on your style and taste. Being a plus size bride present unique situations. The main one being the availability of the dresses. 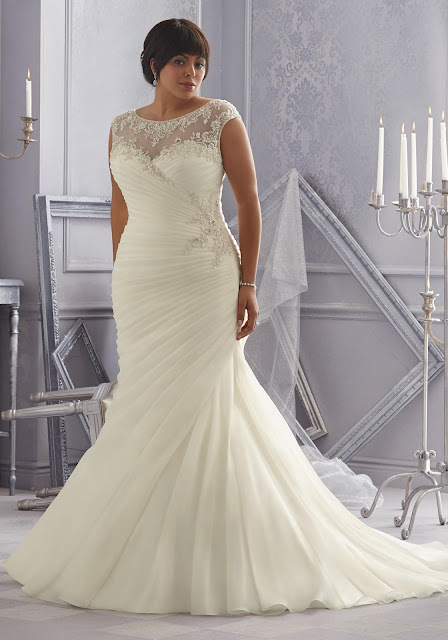 Many articles will tell you, which I have found to be accurate, that not very many bridal salons carry sample size gowns over a size 12. Although the dress you have your eye may come bigger, actually being able to try it on probably will not be an option for you. If you can find a place that either specialize in larger sizes or carry designers whose focus is dresses for the fuller frame, you are in for a bit of a ordeal. There's no need to worry though; starting early will help keep you on track to wedding time. Some say to start shopping at lease 6 months ahead of time for your gown. For the plus size beauties I would say allow yourself 9 months if that is possible. This would help when ordering your dress as well as any necessary alternations that may need to be done to the gown. Now, more so these days women are planning entire weddings for 6 months, if not less, from the time of engagement. If you fall into this category, time is truly of the essence, and yes, it can be done. As with anything, this is very important. Start searching the Internet for dress ideas. Have a certain designer in mind? Check out their website to see what they offer the plus size bride. Print out pictures to use as reference. One sure way to cut down time is to call the salons before you go. Say you saw this Vera Wang creation that you absolutely love, and guess what, they have the size 16 you need. Make sure you utilize the store locator to see if there are stores in your area. If there is one, call the store to see if they have that specific style number or styles that may be close. By doing this, it will eliminate the tedious task of doing going from shop to shop trying to find something. Once you have chosen your store of choice, go in focused. You will see a lot of dresses, but don't become so distracted that you spend time putting on dresses that are not in your budget or fit your style type. No matter what garment you wear, you want to make sure that you are comfortable. Make sure that your alternations are not too tight. You want your dress to fit you like a glove, but you also want to be able to sit comfortably and more importantly breathe. Remember that foundation is key, so take the time to shop for quality undergarments as this will also help you with your fit as well as comfort. If you are wearing a strapless down, make sure that it fits tight enough so that you are not pulling at it all night. Wedding gowns can be a heavy thing to wear in itself with your crinoline slip so don't add to it by a dress that does not fit properly. Hopefully these few tips will help aid in the dress shopping adventure. Most importantly it will help you to pick the gown that makes you feel confident and as you walk down to meet your soon to be husband that all your dress will reflect how you wanted to feel at that moment.